John Carpenter’s a funny little muddle. He’s a filmmaker who seems to be split down the middle, a man who would probably be more at home making Westerns in the 1940s or 50s, but who obviously wouldn’t be the filmmaker he eventually became without growing up on a mix of Howard Hawks and the science fiction and monster movies from that same era. It is therefore no surprise that the Howard Hawks/Christian Nyby monster movie The Thing From Another World became such a formidable and defining influence on Carpenter. But Carpenter has been making films for a long time now, about forty years, and the quality, most would agree, has been sagging for a while. His most recent film, The Ward, has some prominent defenders, but by and large it was received as a professionally made bunch of nothing, nothing close to the kind of comeback his fans had hoped for. Oh well, as they say. The curious thing about Carpenter’s weary skid is it hasn’t been greeted with the kind of mockery, or at times even gloating, that, say, Martin Scorsese’s supposed loss of edge (a view I don’t share, as I think I’ve made clear in the past) has engendered. People still like Carpenter, and root for him, and are sad, but understanding, when he doesn’t meet our expectations. I have to point out that I’m no different in this regard – I wasn’t crazy about The Ward myself – but just typing that previous sentence makes me aware that fandom carries with it a certain condescension towards its object. It’s just that once Carpenter was so good, and now he’s not quite that anymore. He’s made a number of acknowledged classics in various genres, from Assault on Precinct 13 to Halloween to Escape From New York to his pinnacle and masterpiece, The Thing, a remake – sort of, though the number of similarities are probably equaled, if not dwarfed, by the differences – of the Hawks/Nyby film. The era that produced those films, the mid-1970s into the early 80s, must be counted, from a film historical viewpoint, as Carpenter’s heyday, but as is often the case with filmmakers with deep bodies of work, some of the most interesting stuff is happening on the fringes, meaning just before and just after the undisputed Great Works. For example, and the point of the post, finally, for chrissake, with 1982's The Thing, Carpenter would begin what he now refers to as his Apocalypse Trilogy, though this is very loose in trilogy terms, and I suspect he didn't regard these films as such until the third one was completed and he could step back and think "Hey, there's three that are sort of like that." The third film is 1995's In the Mouth of Madness, a good and interesting movie I hope to get around to writing about sooner rather than later, and in the middle is Prince of Darkness, from 1987. While not Carpenter's best film, Prince of Darkness has long struck me as his most interesting, and bizarre, and even personal. Prince of Darkness is such a weird mix of standard 1980s horror gloss and rather cerebral ruminations on the cosmos and phsyics and God and evil that it's both easy to see why its cult has been so slow in growing, and frustrating that horror is a genre where the best work is often only appreciated well after the fact. "Horror was good and now it is bad" is the mantra that has left a number of good movies and books scrabbling in the dust, and it's a mantra I am not immune to muttering over and over myself. However, it's my speculation that the indifference with which this film was met partly led to the apparent indifference with which Carpenter now seems to regard filmmaking ("It's still shot, reverse-shot, over-the-shoulder..." Carpenter recently said in an interview with Mick Garris on Fearnet). I mentioned this to some people, and persuasive counter-arguments were offered. All I can say is, that's how it feels. 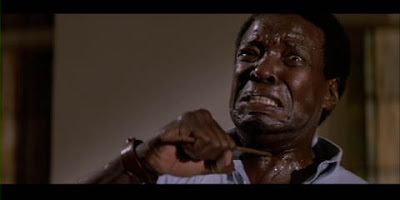 But Prince of Darkness really is special. 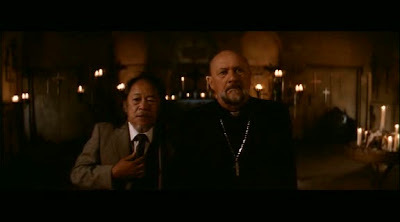 It concerns religion and science, personified by a priest played by Donald Pleasance and a theoretical physics professor named Birack, played by Victor Wong. The two men are old friends -- and, you sense, philosophical sparring partners -- and as the film opens the priest has sought out Birack to help him with a mysterious problem. Which boils down to this: in an ancient and shadowy tomb-like room beneath the priest's church is a massive glass and metal cylinder, and inside the cylinder is a roiling green liquid. This cylinder has been kept a secret by the church, basically forever, so long that nobody living even understands it. But it's clear that what the liquid is, and means, and will do, is about to become very apparent. So Birack puts together a team of grad students -- biochemists, molecular physicists, microbioligists, even one studying Latin and ancient theology -- to camp out in the church and study the situation. So what is this all about? Well, the film's title should give you some clue, but the key to the film's fascination is how Carpenter (writing here under the pseudonym Martin Qautermass, a choice that won't seem terribly odd if you've at least seen Quatermass and the Pit) reconstructs the universe. Eventually, Birack will explain that what the priest has always believe is essentially true, that there is a massive intelligence that controls the world on a subatomic level, a God, but our perception of that intelligence has been skewed by various things over the millenia, not least our desire to project benevolence onto the cosmos. But this is wrong. As there is matter, there is anti-matter, as there is Christ, there is Antichrist, although as far as Prince of Darkness is concerned, Christ was something other than what we imagine. The point being that, whatever our idea of God is, the truth is opposite, and the universe's Great Intelligence is an Anti-God. Who is forming, or re-forming, within that cylinder. This is all very complex stuff, and Carpenter does a wonderful, chilling job of combining the ideas of very abstract science with visions of doom -- there's a nice shot of Brian Marsh (Jameson Parker), the film's theoretical hero (in that he's the one who develops a romantic interest), watching a TV show about quantum physics, and the camera moves down the back of the TV set to show it covered in insects. Insects are big in Prince of Darkness -- they turn up as an image, a symbol of apocalyptic doom, casually throughout the film's early going, but later take on the role of occasional eaters of the dead. I said before that this so-called "Apocalypse Trilogy" is rather loosely tied together, and it is, but there are still interesting connections beyond them all simply being about the end, or possible end, of the world. 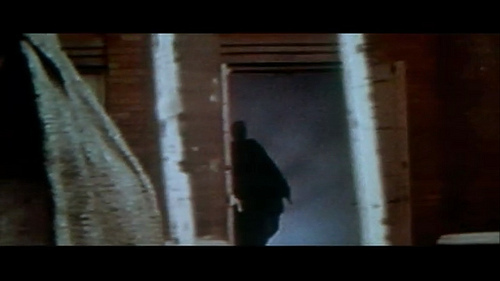 For instance, I somehow had not noticed before how Prince of Darkness picks up on the theme of one's body being stolen and used by an otherwise unseen and malevolent force from The Thing (as well as Invasion of the Body Snatchers, while we're at it) and merged it with the more straight-up horror concept of demonic possession. Because while Carpenter's Anti-God might be less supernatural than scientific to a degree we're as yet unable to fully grasp, it does possess various characters when the green liquid begins to escape, and is soon able to transfer, via a, come to think of it, very Exorcist-like green spray from one possessed person's mouth to another, now also possessed person's mouth. There's also the horde, for lack of a better term, of possessed homeless people, both covered in and sometimes proferring (and possibly consisting of) insects, who block any attempt at escape from the church. Admittedly, it's not as if Carpenter could show you his math, but conceptually he is rendering the demonic possession of one's soul in scientific, even subatomic, terms. Not only that, but to hear Carpenter tell it, our end will come from space. This is shown explicitly in The Thing, with the distant shot of the alien ship crash-landing on Earth. In Prince of Darkness we're talking about a cosmic intelligence, the mind of the unknown universe, wanting to reform itself and destroy us (although, too, there is, in this film, the idea of our savior coming from the same place). With In the Mouth of Madness, things get much less scientific, or theoretical, or whatever, but that film is also explicitly Lovecraftian, and where did Lovecraft's Old Gods come from? The ones that don't come from the oceans, I mean. They're up there in space, waiting. In this sense, Prince of Darkness is every bit as Lovecraftian, its final air of hoplessness and cosmic malevolance is one Lovecraft would have understood. As implied earlier, though, Prince of Darkness does also enjoy, or anyway have, the unusual distinction of being all this stuff I’ve just described, and also a horror movie from the 1980s. This is sometimes held against it, because in the movie people where those shirts they used to wear, and Jameson Parker is in it. Well, to begin with, Tachyon beams or no Tachyon beams, none of us are going to be able to go back in time and stop those shirts from happening, and second, I think Jameson Parker is really good in this movie (also very good is Donald Pleasance, in what must be counted as among the best of his late-career performances. He has a number of wonderful moments, but the best is when the priest is attempting to perform Last Rites on one of the characters, before realizing that the power he thought this ritual had has been proven false. Pleasance plays this moment with in a way that is very quietly heartbreaking). He’s often singled out for ridicule, anytime someone wants to praise Prince of Darkness while also signaling that, in some ways, they are above it, and this has to do mainly, I think, with his mustache, to which let me respond by simply referring you again to the fact that Tachyon beams will not help us. But Parker is very good here, honestly. There are a lot of little things, such as the way he reacts to a bad deal in a hand of solitaire he’s seen playing early on, or the way he distractedly delivers the cheap joke “Where were you planning on taking him?” in response to his friend’s (Dennis Dun) complaint that this church business is keeping him from a hot date. But again, Parker’s Brian Marsh is only the theoretical hero. He’s presented in the movie as the handsome young man who falls in love with the pretty young woman (Lisa Blount), is smart and capable and brave, but in the end he doesn’t actually do much of consequence. Not for lack of trying, mind you. It’s just that…he can’t. The opposition is too much. That pretty young woman does much more, and gives much more, but it’s Marsh’s realization that even this may not have been enough that closes the film. The final moments of the film are very effective, though in terms of imagery it pales next to Carpenter’s masterstroke. In the film, all the characters start sharing the same dream. The reasons they’re sharing this dream are made clear, but it’s the image of the dream, the nightmare part of it – because the dream is part nightmare, part hope – that really stuns. It appears to be a video recording of the front of the church. We’re told it’s from the year 1999, a not insignificant year in regards to what Prince of Darkness is on about. And in the doorway of the church, we see a figure. In context – and maybe even out of context – this is one of the richest, in terms of generating fear and dreadful mystery, horror images I’ve ever seen, certainly from the 1980s, a decade which was sort of a wasteland when it came to this sort of thing. And it, the image, isn’t even all that much, but this, of course, is the key. It is, as I’ve said, all fear and dread and mystery. And doom and destruction, and the end of everything. There's a lot to like about PoD and you did a great job summing it up. This is a movie I point to as evidence that horror movies used to be imaginative as well as scary, you don't see that much any more. And on his Apocalypse Trilogy, I always thought They Live could be shoe-horned in there as well, even with its hopeful resolution. I really need to get back on the internets and read more. Great post, Bill. Prince of Darkness is one of my favourites, a contender for that rare category of film that really would be good to spontaneously sequelise thirty years later. It's also to be loved for providing creepy samples for the DJ Shadow album Endtroducing..., which is probably how I learned about the film in fact. "And in the doorway of the church, we see a figure. In context – and maybe even out of context – this is one of the richest, in terms of generating fear and dreadful mystery, horror images I’ve ever seen, certainly from the 1980s." Yes indeed. That ending imagery freaked me the eff out when I saw the movie in the theater. Can't recall many other movies that had that effect on me from that era. Haven't seen it since, basically since I've never been a big Carpenter fan, other than loving the obvious masterpieces. Why Didn't You Help Me?